Engraving by Enea Vico, 30.4 x 41.2 (Bartsch). Inscribed in the lower right corner: AENEAS VIC . PARMEN ..
Bartsch, XV, 1813, 297, 31, as after Primaticcio. Le Blanc, 1854-1890, IV, 118, 31, as after Primaticcio. COLLECTIONS: Florence, 16985ss. London. Los Angeles (Ruiz). Herbet, III, 1899, 32 (1969, 124), under no. 6. De Witt, 1938, 87, as after Rosso? Poirier, 1964, 63, as Vico after Rosso. C. Davis, in Giorgio Vasari, 1981, 274, under no. 32. Schab, 1986, 61, no. 50 (Los Angeles, Ruiz). Davis, 1988, 158-159, no. 61, Fig. (Los Angeles), as after Primaticcio. It is most likely that this print is the one mentioned by Vasari. But as Bartsch correctly pointed out, Vasari is wrong in his attribution of its design to Rosso, for its design is after Primaticcio. The print is closely related to a drawing in the same direction by Primaticcio in the Louvre (Inv. 8533, pen and ink and red chalk, 31.2 x 43.5; Dimier, 1900, 427-428, no. 21; and Bacou and Béguin, in EdF, 1972, 140, Fig., 141, no. 150, as Primaticcio for the painting above the fireplace in the Cabinet du Roi at Fontainebleau, 1541-1545). This scene was engraved by the monogrammist F.G. (Bartsch, IX, 1848, 25-26, 4; Dimier, 1900, 495-496, no. 69) and by an anonymous etcher of the School of Fontainebleau (Bartsch, XVI, 1818, 403-404, 71; Zerner, IB, 33, 1979, 346); according to Bartsch, the latter is copied with some changes from the former. Enea Vico’s print would seem to be copied from one of these prints. 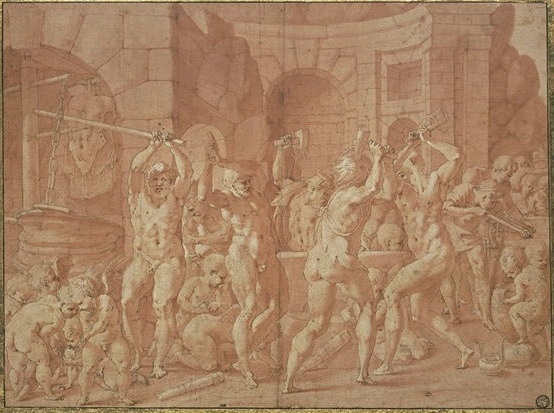 The connection of the print to Primaticcio’s drawing in the Louvre (Fig.RE.28, Paris 8533) clearly establishes Primaticcio as the author of this composition.